My chamber music career began as the result of Aaron Rosand’s determination to help me move my career forward. His associate in the CBS orchestra (on the C stand) was Elliot Magaziner. Elliot had a piano trio involved in a summer festival in Reston, Virginia. The cellist in this trio had severe alcohol problems and needed to be replaced. Aaron recommended me in the most glowing terms, and Elliot invited me to play trios with him and his pianist David Poliakin informally in order to check me out. We played the Schubert B Flat and the Mendelssohn D Minor trios. We played at David’s house in Great Neck while our wives listened attentively. With that evening the deal was sealed and I became the cellist in the Reston Trio. Since up to that point I had played exactly one serious chamber music concert it was daunting to face six weeks of concerts each of which had three pieces on the program. Additionally, before and after the six-week summer session we did small tours in the area with June playing second violin in a string quartet program. All of these concerts were associated with the Northern Virginia Music School at Reston. SO in addition to getting a chamber music concert put together every week we also had other responsibilities. Mine involved playing in the orchestra, coaching the cello section and chamber music groups in the afternoon, and playing the Dvorak Concerto with the orchestra. For me it was a formidable challenge to get pieces like the Tchaikovsky Trio, Mendelssohn D Minor, Schubert B Flat, Trout Quintet, Mozart Divertimento, and 13 others up to performance standards. Elliot had a very hard-nosed attitude about showing up and doing your job. He didn’t care that I had never played the Tchaikovsky Trio, only that I showed up on Wednesday evening and played it. In this environment I learned to prioritize what and how well needed to be played and get from beginning to end without stopping. I would like to add these were two things that I did not learn at Juilliard. Because of Elliot’s enthusiasm for the results of our work he booked Carnegie Recital Hall for two concerts the following March and May. In retrospect I have to admit that I owe Elliot Magaziner a great deal for having me put up on an important New York stage for the first time in my life. I was absolutely petrified at the prospect of being unfairly reviewed in the New York Times for all to see. If it had been up to me, I wouldn’t have done it at all. Thanks to surviving the experience of playing two New York concerts in Carnegie Recital Hall I had the confidence to make my Alice Tully Hall debut one year later and what would end up being at least 25 other New York concerts. My mother wrote a poem: It’s a little step from one to two, it’s a little step from two to three BUT the step from zero to 1 could take eternity. During the lead up to those concerts I was insecure to the nth degree. Elliot basically sheparded me through to the best possible conclusion, and I will always be grateful to him for his unwavering faith in me, his willingness to back it up with his money, and his willingness to put his own career on the line playing with me in these concerts. The second summer spent at Reston involved my first performances ever of two of the most difficult pieces in the cello repertoire, the Haydn D Major Concerto and the Schubert Arpeggione Sonata. Since I was anticipating making a solo debut in New York at Alice Tully Hall I used my connections in Reston to play the Francoeur Sonata and the Schubert Arpeggione at least ten times in the area. June filled out the program with the Debussy Violin Sonata, and we played the Brahms B Major Trio to conclude the program with our pianist friend Gordon Steel who came down to Reston to help us out. This was absolutely invaluable experience because it was sort of like a boxer who starts with easy opponents as he works his way up to the heavy weight championship. It was in conjunction with my Alice Tully Hall debut that I got my first whiff of the incompetence and unnecessariness of managers. Everybody told me you have to have a manager in order to be credible, so I used connections of mine to get one. Her name was Sarah Tornay. I charged her with booking Alice Tully Hall for me on May 15, 1971. Additionally, she was supposed to print up a flier, do something about getting an audience, and getting the New York Times to review it. I asked her to take care of these things in May of 1970. When I got back to New York after the 1970 Lyric Opera season in late December I called Alice Tully Hall to make sure that I got my date. The manager whose name was Louise Homer (not the famous opera singer of the same name) told me that she never heard of me and May 15th was already taken by the Chamber Music Society of Lincoln Center. I asked her whether May 22nd was available she said it was. I asked her what I needed to provide in order to get it. I said that I could provide reviews and letters from conductors. She said, “Just bring a check.” I have written about this extensively before, but briefly, I went down to Alice Tully Hall and gave Louise Homer a check. Then I went to the front of Alice Tully Hall and checked out fliers for upcoming events. I noticed that the very best fliers came from the management of Sheldon Soffer known to my dear friend Hensen Markham. I called Hensen if he could find me the name and telephone number of the graphic artist that worked for Soffer. He did, and I immediately called this man (Walter Harper, a great graphic designer who worked for me for the next 20 years. Below is an example of his work.) and went down to see him right away and told him what I needed. SO without the help of management I had a hall and a flier. In terms of getting an audience I wrote letters to everybody I had ever known, inviting them to come to this concert, and in a word, had the first full house in the history of Alice Tully Hall for a debut recital up to that date. 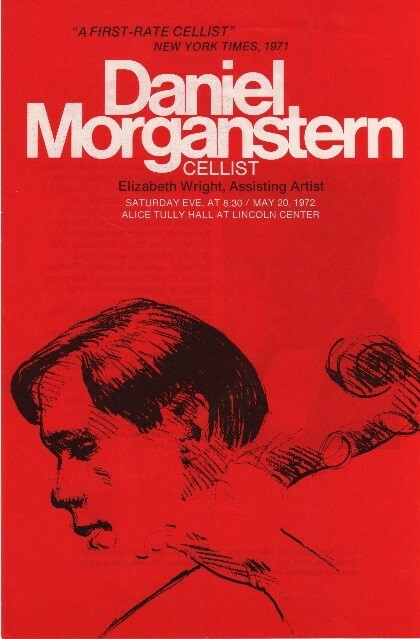 I also got a good review and a fantastically good one two weeks later on another concert (which I also organized) at Carnegie Recital Hall from of all people, Donal Henahan, the terror of the New York times, who dubbed me a “first-rate cellist” a quote which I have used for nearly fifty years. As we found from our experience in Reston there was absolutely no substitute for small concerts in an unthreatening environment to prepare for the big ones, and that is how the American Chamber Trio got launched. During my time at Reston I heard advertisements on WGMS Washington, D.C. for the Coolfont Recreation and Conference Center in Berkley Springs, West Virginia who hosted concerts of students from the Northern Virginia Music School. Because ABT had a summer season at the New York State Theatre I had decided not to return to Reston and quit the Reston Trio I wrote to the owners of Coolfont asking whether they would like to have professionals, like me and June, for their summer concerts instead of students. They responded almost immediately asking us to come down for a week and play four concerts, Thursday, Friday, Saturday, and Sunday. In order to fulfill this engagement, we needed a pianist. June had gone to the Manhattan School of Music with Peter Basquin. We asked him whether he would be interested and he agreed after telling us that he had just won the Montreal International Piano Competition. Even at that high point in his career, it was not lost on Peter that the chance to play next year’s repertoire four times in public was a very good idea. I also had a recital at Alice Tully Hall planned for 1972. And like me, Peter had played a debut recital at Tully Hall in 1971. The three of us went down to Coolfont and played our four concerts and stated a relationship that continued for the next 33 years. Over time Peter played at Coolfont important works of Rachmaninov, Ravel, Liszt (particularly the 6 etudes of Paganini), and the paraphrase from Rigoletto. I believed it helped him prepare his 1974 Alice Tully Hall concert where he played, if memory serves, works by Brahms Op. 17 or 18, Beethoven Apassionata Sonata, and Stravinsky Petrouchka brilliantly. Many years later I got the recording of Andre Watts playing the 6 Paganini etudes and if he played them better than Peter he didn’t play them much better. I prepared and played the Boccherini A major and the Schubert Arpeggione Sonata all four of those first concerts. In later years I played multiple performances of sonatas by Brahms, Beethoven, and Rachmaninov, all of which I recorded. Also, June and I did multiple performances of duos by Kodaly and Ravel which we also recorded. We played on and off together for the next three years and decided to play serious concerts in New York in 1974. We booked the New York Cultural Center for three concerts, one of which was devoted to the music of Charles Ives. Because of this concert, we were invited to play at the National Gallery of Art in Washington, D.C. on their series devoted to the 100th Anniversary of Ives’ birth. Also we were invited to play at the Museum of Contemporary Art in Chicago. We recognized at that time that while there were many artists, there were relatively few managers. After two other encounters with managers of different sorts we decided to incorporate since we knew that every presenter always knew a better artist or a cheaper artist. To put ourselves on a level playing field to deal with presenters on an equal basis, we decided to become a management ourselves and incorporated as American Chamber Concerts, Inc. In 1975 the American Chamber Trio made its debut at Carnegie Recital Hall in two concerts with large audiences and good reviews. During the time that led up to this decision, I had two encounters with functionaries of organizations that supported young artists. The first was the New York State Council of the Arts. At that time everybody wanted to be able to say, “This concert was made possible by the New York State Council of the Arts.” I went down to talk to them in my best suit and shined shoes to tell them that I want to play concerts. They told me all their grants were matching grants, so I offered to give them a check for $2,500. They rejected that idea saying, “That I had to actually raise the money from many different donors,” and then write a proposal for something which they would either approve or not. I explained, very patiently, that my fundraising ability was worth five dollars an hour tops but my cello playing ability was worth at least $25 to $35 dollars an hour, and besides which, why would I want to write a proposal for something that would interest them which they could also reject to play for a rate of pay I wouldn’t consider in the commercial world. So with that insight, I decided that I could damn well finance my own concerts, and play the things that I wanted to play, when I wanted to play them, and if I was lucky, and persistent, and practiced hard enough how I wanted to play them. The other insight that manifested in those years leading up to our incorporation as American Chamber Concerts, Inc. was when I auditioned for an organization called Affiliate Artists. Their grant was $10,000 to do ten weeks of concerts someplace in the Hinterlands, if you got it. Anxious to get one of these grants for myself I practiced assiduously for six weeks on my very best repertoire, all of which I had played at Alice Tully Hall. Even if I have to say it, I played really, really well at my audition. Right after I played, a colleague of mine played in a totally substandard manner. When he got it and I didn’t I recognized the fact that going hat in hand to anybody was a total waste of time and much better to create my own opportunities where any competition would have to come to me. Those insights created a management that got international tours, put on major concerts, and created tremendous credibility for me and my associates. The American Chamber Trio was active from 1971 to 2011.